AAMI Insurance has released a new TV ad to promote the Roadside assist service. The 15-second spot features Mick and BT stuck in the rain, with their car battery dead. Luckily, Mick has AAMI Roadside assist, so they are not forced to spend much time trying to find a solution. The song playing in the background is Brenda Lee’s “Danke Shoen”, from the 1964 album, “By Request”. 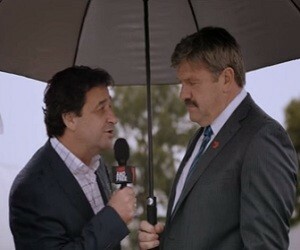 The voiceover mentions, at the end of the advert, that AAMI is a proud partner of Channel 7’s AFL coverage. Previous story Defence Jobs Australia Commercial 2016 – What Will You Bring?